The entire team will carry the flame on Jan. 15. KT Rolster’s League of Legends roster is set to become one of the first esports teams to carry the Olympic flame when they take part in the 2018 Winter Olympics torch relay on Jan. 15. The five KT Rolster players will hold the Olympic torch for around three minutes each from 13:04 to 13:19 local time. All five players will run through parts of Seoul in front of a huge crowd. Esports are extremely popular in South Korea, and the inclusion of some professional players in this ceremony could be crucial for any future consideration toward esports becoming a part of the Olympics. KT Rolster retained its entire roster for the 2018 season off the back of a disappointing Summer Split. The team failed to qualify for the World Championship for the second straight year, losing to Samsung Galaxy in the LCK Regional Finals. 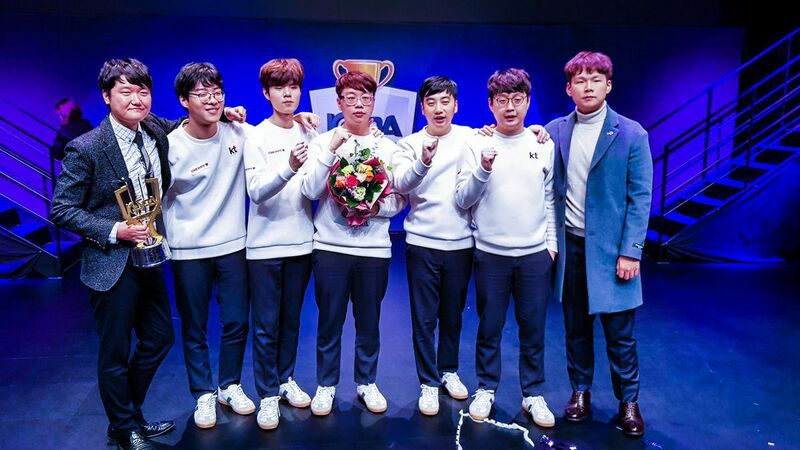 But KT bounced back at the end of the year, beating Longzhu Gaming in the KeSPA Cup finals to win their first title as a team. The 2018 Winter Olympics will be held in Pyeongchang, South Korea from Feb. 9 to 25, bringing together the nations of the world to compete in winter sports such as hockey, snowboarding, and skiing. This isn’t the first time that esports have worked together with the Olympics, however. Intel partnered with the International Olympic Committee in November 2017 to hold an Intel Extreme Masters tournament in the lead-up to the 2018 Winter Olympics. IEM PyeongChang will feature StarCraft II gameplay and is set to take place from Feb. 5 to 7. This article will be updated when more information becomes available about how to watch the 2018 Winter Olympics torch relay.